Collaborating, learning, and supporting the coaching process in underserved districts. Guest Writers: Kathi Lippert, Ed.D. As instructional coaches, how do we address this sentiment towards change in the field? In our vernacular, we must replace “change” with “autonomy.” To ensure success in the classroom, we must work to empower our teachers and provide them with the means to make effective progress towards reaching new goals in literacy. How do we accomplish this? One way is action research. Action research is an ongoing, cyclical process in which the teacher has the authority to make significant growth. The word research, however, may induce panic. It is important to remember that action research is conducted for shorter increments, allows for more flexibility, and usually includes various types of data. In action research, reflection drives inquiry, and the results of which, positive or negative, fosters insight into the dynamics of teaching and learning. It can also provide an opportunity to promote collaborative learning teams within a grade level and across disciplines; it can also be utilized as a method to track progress towards personal evaluation goals. Coaches can assist practitioners with reflecting and identifying areas of improvement; this is the first step in the action research process. Regarding literacy instruction, this can include improving reading scores, forming strong home-school relationships to foster literacy habits, sharing at-home reading strategies, conducting a study on literacy interventions, closing the summer slide, increasing student motivation, or offering professional development in literacy instruction. To choose a focus area, a teacher must reflect upon his or her own methods as well as the data and student evidence available. After an area for improvement is identified, the coach and teacher must brainstorm potential solutions. It is recommended that possible solutions be discussed with school stakeholders including administration, colleagues, parents, and perhaps even students. Additionally, it is prudent for the literacy coach and teacher to review similar studies and research-based methods before determining how to rectify the problem. Once a focus area and intervention are chosen, a research question (or two) is created. What impact does allowing students to engage in a kid’s blog have on their attitudes towards reading at the middle school level? How does a “Parent Toolkit” increase parents’ confidence in supporting their child’s reading skills? How will a morphology study improve student vocabulary acquisition? Determine participants: who will be included, how many participants, gender, socioeconomic status, learning needs, etc. The key to action research is to be committed yet flexible. Some components may need modification as the research progresses. Again, the process is cyclical. Once data is collected, it is analyzed to determine efficacy of the intervention and to sufficiently respond to the research question(s). The final process in the action research is to draw conclusions and consider the implication of the intervention to determine the next course of action. Educational action research is a system of inquiry that educators, administrators, and literacy coaches may utilize to ensure progress within schools. Through the action research process, practitioners become knowledgeable about research based instructional strategies to improve pedagogy. There is a myriad of benefits for conducting action research projects within classrooms, buildings or school communities. The action research process provides educators credibility in their designated disciplines. It allows practitioners the freedom to examine their own teaching as they reflect upon their own instructional strategies to improve best practices. Such an endeavor empowers educators to have a voice in a field that often is encumbered with mandates and top-down directives from state and local policy makers as well as educational managers and administration. Action research allows educators to become creators of their own knowledge about the business of teaching and learning rather than mere consumers of other researchers’ exploration and experience. Further, the process of integrating action research into a daily regimen stimulates collegiality as it provides an opportunity for teachers to work collaboratively with coaches towards a common goal. Articulating with colleagues regarding instructional strategies, educational modalities, and interpreting and analyzing qualitative/quantitative data promotes intrigue, inquiry, decision making and reflection about teaching. Conducting research studies enables practitioners to be invested in the data collection process. Educators become revitalized while conducting studies where such a goal fosters ingenuity, creativity, problem solving and academic discovery. Practitioners, who are passionate about their own methodology, implement action research studies to evaluate their own work as they reflect upon the importance of making positive change in the classroom. Such an academic goal increases trust, improves communication, and empowers educators to take a stance for real change that benefits both teaching and learning. It is apparent that initiating an action research project motivates educators to make a difference in areas of critical need in any discipline (Hendricks, 2017). In Part II, we will examine sample studies to demonstrate how this type of research provides teachers with an opportunity to generate their own progress. *Sara is an experienced teacher in an urban, private grade school. In her study, Sara expressed a desire to provide her 3rd grade students a “stepping stone between explicit instruction and independent reading.” Cross-grade level social activities were typically successful at the school; therefore, Sara decided to incorporate the same principle into literacy instruction. Based upon reading ability, Sara paired her 3rd grade students with 5th grade students to become reading partners. Her research questions focused on improving literacy comprehension and reading motivation among her 3rd grade students. During the intervention, the “reading buddies” read a story collaboratively and the older students initiated proper responses to the literature using research-based strategies. Consequently, third grade-participants engaged in motivating, effective literature discussions. Initially, the researcher coached the 5th grade students in appropriate literacy strategies including the five-finger summary and plot-concept relationships. The literature used during these sessions was taken from the 3rd grade basal. The pairs met once a week for six weeks; each session lasted approximately sixty minutes. Sara, the researcher, used both qualitative and quantitative tools to measure the efficacy of her project. Those data tools included: weekly comprehension tests, teacher observation, student literature logs, sample work, and student surveys and interviews. Thirteen of the twenty 3rd grade participants showed an increase in comprehension scores on the weekly tests administered. Struggling readers saw the biggest gains averaging an 18.6 increase in points on their comprehension test as compared to the baseline data. There was also a 63% increase on the reading motivation post-survey. Additionally, 83% of the students noted a positive experience with their “reading buddy.” It was evident that most of the participants were more excited about reading, and in their interviews, many expressed a preference for the reading buddy discussions as opposed to traditional methods. Another graduate student, *Abigail, a secondary education teacher, focused her AR project on content-area reading strategies and their impact on learning outcomes, comprehension, and student motivation. Three high school science teachers, each with over 15 years’ experience, were chosen to participate in the study along with their 142 student participants. Abigail’s first task was to observe the classrooms to see how each course was conducted. After observing the classrooms first-hand, Abigail chose various research-based literacy strategies she believed would complement the content well and shared these with the three colleagues. Those strategies included: the GIST, the RAFT, Possible Sentences (prediction strategy) and a word web graphic organizer (Johns, 2006). The teachers utilized course textbook selections and content articles of their choosing alongside the literacy strategies. Once Abigail had collected baseline data on student progress in each course, she was prepared to implement her intervention. The overall impact on comprehension was limited due to time constraints, but Abigail noted some interesting and encouraging findings. For example, most students interviewed enjoyed the RAFT strategy the most as it allowed more creativity and flexibility in expressing their understanding of the content. Half of the respondents also stated they could use the Possible Sentences strategy in other content areas. Similarly, the teachers also saw the value of using a pre-reading strategy such as the Possible Sentences strategy. Furthermore, all three teachers agreed the study was beneficial and expressed willingness to use literacy strategies in the future. *Jamie is a 4th grade teacher at a suburban grade school. To motivate students to read and utilize learned literacy skills during the summer, Jamie designed a reading website which included substantial responses. Her primary research question read as follows: “How might a reading website, which includes student response, affect student reading habits over the summer?” As an added incentive for participating, Jamie offered a reward party when the study ended. Many students showed interest in the summer website, but in the end, she was only able to attain commitment from six participants. Of the six students, three were considered advanced readers, two were at-level, and one student was a striving reader. Before the school year ended, Jamie prepared the 4th grade students for the study by reviewing good literacy habits the students learned throughout the school year and sharing information regarding substantial posts. First, they could choose among three response formats: a written response, a drawing, or a video. Next, students were to demonstrate their comprehension using good literacy strategies such as connecting or predicting, and they were encouraged to provide textual evidence in their posts. Students were allowed free choice of book selection. Finally, it was expected that students post twice a week-one post of their own and one post to comment on a peer’s response. The researcher shared expectations with the participants’ parents. Jamie collected data for five weeks over the summer. She used student surveys, parent surveys and rubrics to assess student posts. Jamie also tracked frequency of responses to monitor participation. Jamie better understood key factors in motivating students to read throughout the summer. The students noted parental reminders and the party as motivators, but half of the students also reported that they enjoyed seeing their responses posted on the site as well as seeing their “friend’s” responses. Another finding derived from the parent survey was an increase in frequency of summer reading. According to the parents, their child read more during the study than in previous summers by reading at least three or more days per week. Next, all but one student stated they would participate in the summer reading website again if given the opportunity. One student replied that he already liked to read, and his mother requires him to do so regardless. Data from the student response rubrics proved to be comparable to the work students provided during the school year. There did not seem to be significant gains made in their reading habits or abilities, but nothing was lost either. The students were independently employing literacy strategies appropriately in the posts and avoiding the “summer slide.” An unexpected finding in this study was an increase in parental involvement. Reminding students to read and complete the responses was a key motivating factor in student participation. The researcher gained consent from the parents and shared the information with them, but the researcher did not anticipate the parents taking such an active role. It was an unintended, positive by-product. Whether the teacher was seeking to increase reading scores, coach colleagues on literacy strategies or support summer reading, each one of the case studies demonstrates the power of action research in providing teachers worthwhile data or insight to enhance literacy practices. To ascertain the lasting impacts of action research, twelve graduate students voluntarily participated in a survey regarding their action research studies. The survey results denoted below pertain to the experiences and opinions of those practitioners who conducted an action research project. Practitioners agreed that generating and conducting an action research project improved their instructional practices and pedagogy. Based on the results, all respondents concur that significant academic and ancillary gains were achieved during the intervention throughout their action research study. Over 90% of the practitioners agreed to implement similar interventions or strategies within their educational setting and value its sustainability for all stakeholders involved. Based on the survey results, all 12 respondents see the value in conducting data analysis to determine academic strengths and deficits as well as to drive instruction. Collecting data is instrumental as the practitioner progress monitors participants during the action research implementation. All respondents concur that a constructive benefit to implementing action research is the opportunity to collaborate with colleagues regarding best practices. Below are testimonials from the survey participants who conducted action research project within their classrooms or schools. It is evident from the survey results as well as the practitioners’ testimonials, that conducting action research clearly benefits all stakeholders involved in the education process. It is imperative for educators to be passionate about a topic because this fosters diligence and maintains sustainability throughout the study. Subsequently, conducting action-based research studies enables practitioners to become more invested in the instructional practices in their discipline. As researchers, teachers become acutely invested in data collection as they become critically aware of students’ academic progress. 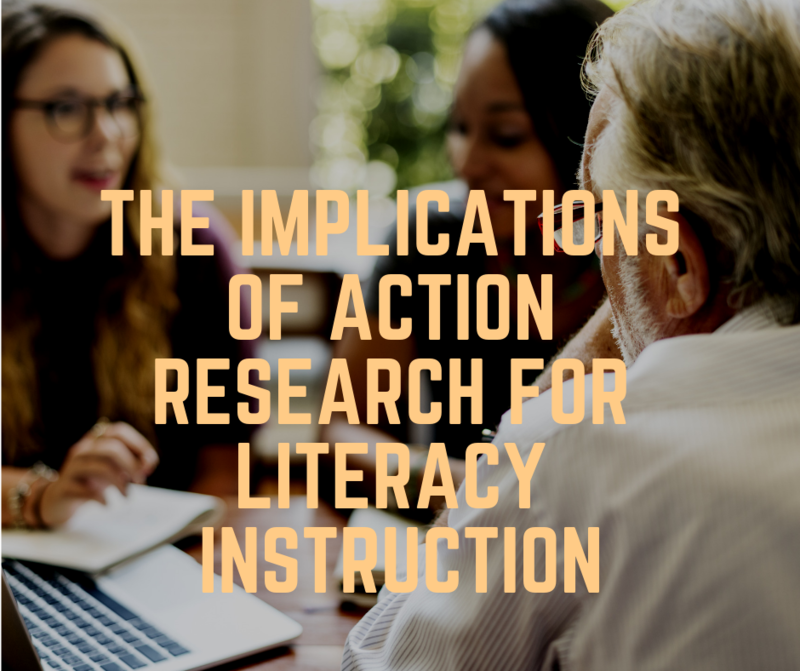 In summary, conducting action research proves to be instrumental in providing opportunities for literacy coaches and classroom teachers to develop and integrate differentiation, explore innovative strategies, and become adept at data analysis. Implementing action research studies allows practitioners to identify both curricular and student strengths as well as areas needed for improvement. Furthermore, discovering effective activities that motivate and engage students can transform literacy practice in the classroom. Ultimately, conducting action research enables educators to have an assertive voice in their decision-making as it pertains to instructional practices within their educational setting. This article gives excellent information regarding Action Research! I will be sharing this article with colleagues and students! Excellent work!